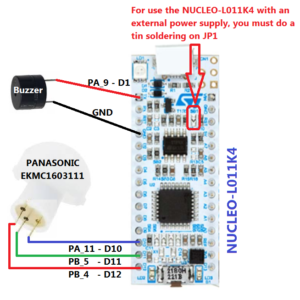 This is a simple example that use a PIR sensor (PANASONIC EKMC1603111) connected to the NUCLEO-L011K4 for a future applications in build/home automation. 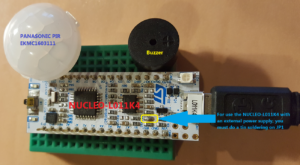 This demo drive a Buzzer and the LED present on the Nucleo board in case of PIR detection. The SW was developed using the mBed online compiler, so is very easy transfer this project on other MCU. The source SW is here. The bin file ready to use for this project is here. PANASONIC – EKMC1603111 – see here, here and here.